Heather Webber's Midnight at the Blackbird Cafe is a captivating blend of magical realism, heartwarming romance, and small-town Southern charm. Nestled in the mountain shadows of Alabama lies the little town of Wicklow. It is here that Anna Kate has returned to bury her beloved Granny Zee, owner of the Blackbird Café. 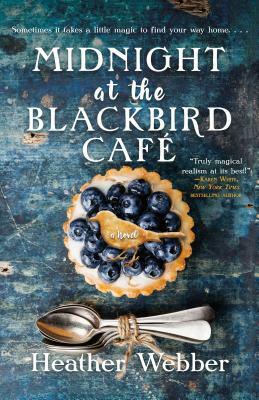 It was supposed to be a quick trip to close the café and settle her grandmother’s estate, but despite her best intentions to avoid forming ties or even getting to know her father’s side of the family, Anna Kate finds herself inexplicably drawn to the quirky Southern town her mother ran away from so many years ago, and the mysterious blackbird pie everybody can’t stop talking about. As the truth about her past slowly becomes clear, Anna Kate will need to decide if this lone blackbird will finally be able to take her broken wings and fly. Heather Webber grew up in a suburb of Boston, where she learned early on how to ride the T, skip rocks in the ocean, and root for the Red Sox. As a young mother, she tried her hand at writing novels and is now an Agatha Award-nominated author. She is the author of the Lucy Valentine novels—Truly, Madly; Deeply, Desperately; and Absolutely, Positively—and the Nina Quinn mysteries, among other books. Heather now lives in southwestern Ohio with her high school sweetheart and their three children.